“Overloading” is the first album of the Israelian band Anakdota. The name Anakdota comes from the Hebrew word Anekdota which stands for Anecdote. 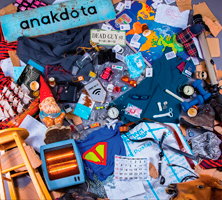 The band added their own comic punch and misspelled the word Anekdota ... so the band name became Anakdota. The album is released on Fading Records, a sub label of the Italian AltrOck group. This label continues to amaze us with their new bands and highly original music. If you take a look at the lineup of the band there are two things that will catch your attention. First there is no guitarist in the lineup. Only on the track “Mourning” you can find some guitar played by guest Yoel Genin. Well for the Fading Records label this fact is not unique. The Italian band Syndone is also keyboard oriented and has no guitarist. The second thing is that the band has both a male and female vocalist. You can find the following eight tracks on this album; “One More Day”, “Different Views”,“ Late”, “Mourning”, “Overloading”, “Staying Up Late”, “The Girl Next Door” and “End Of The Show”. The album opens with a track called “One More Day” and immediately you hear the jazz influences and notice the big role of the piano in the music of Anakdota. Those jazzy bits are combined with melodic vocal harmonies or a nice synth solo. A nice opener that is already revealing the musical craftsmanship of the band. The next song “Different Views” will convince you about that. Complex structures and brilliant playing of drummer Yogev Gabay and keyboardist Erez Aviram. The later is the driving force behind Anakdota. The man is responsible for the music, lyrics & arrangements. “Different Views” is the first brilliant tack of this remarkable album. The track “Late” shows besides the musical craftsmanship also the humor of the band in not only the lyrics but also in the vocal melodies and crazy musical finds. “Mourning” is a special track. The first one with the female vocals of Ayala Fossfeld. Beautiful and modest sung vocals accompanied by delicate piano and bass playing. It is the first and welcome rest point of the album. Some vocal melodies reminds me of the atmosphere of the vocals that Barbara Gaskins was singing on those early Hatfield and the North and National Health albums. Then we go further with piano wizardry and male vocals in the title track “Overloading”. The strong thing in the music of Anakdota is that the complex structures of the music are accompanied by melodic vocal melodies and funny lyrics. Therefore the end result is not sounding too complex and heavy but rather light, fresh and modern. Also the use of male and female vocals is giving the album the necessary diversity. So in the next track “Staying Up Late” the voice of Ayala Fossfeld can be heared again. Now together with the male vocals of Ray Livnat. It is a track with great diversity and nice keyboard solo's. The beautiful voice of Ayala is shining on this track. “Girl Next Door opens” with Emerson like piano wizardry. The piano playing of Ray Livnat is often overwhelming ... what a talented and crafted musician. “Girl Next Door” is an amazing track. The band is slowing down a bit in the closing track “End Of The Show” with delicate female and male vocal harmonies that brings the name of Giant Giant in my mind. But after the slow and beautiful vocal opening the band gives full throttle once more. In the end the beautiful vocals are returning to close this wonderful album. The Israelian band Anakdota is delivering with their debut “Overloading” an album with a mix of complex musical structures and great vocal melodies. The keyboard (piano) wizardry of band leader Erez Aviram is often overwhelming and the name of the late Keith Emerson crossed my mind at one point. The strong thing in the music of Anakdota is that the complex structures of the music are accompanied by melodic vocal melodies and funny lyrics. Therefore the end result is not sounding too complex and heavy but rather light, fresh and modern. Besides the male vocals of Erez Aviram the band is blessed with a second (female) vocalist Ayala Fossfeld. This gives the album also the needed diversity. Often she is responsible for the needed rest points in the music of Anakdota. Otherwise it could be a little bit too overwhelming. The album sounds great, it has a kind of transparency, the crystal clear vocals are wonderful. Anakdota impressed me with their musical craftsmanship and original modern approach. Highly recommended!